By default, when you run Tomcat without any configuration changes, it only supports us with the usual HTTP protocol. To configure Tomcat to support SSL or HTTPS, you can change its configuration with the help of Java keystore generated using Java keytool. How is it in details? Let’s find out in this tutorial. The first step, as we say, we will need to use Java keytool to generate Java keystore. You can refer to this tutorial Generate keystore using keytool in Java to generate yourself a Java Keystore. 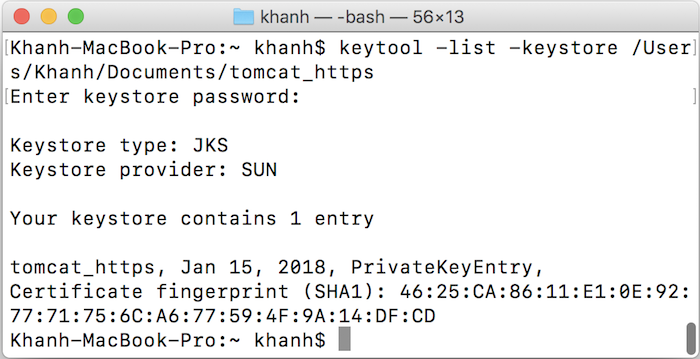 Here, I have generated a keystore named tomcat_https located in /Users/Khanh/Documents. The second step we need to do is modify the server.xml file located in the conf directory of Tomcat. where the value of keystoreFile is the path to the keystore file, and keystorePass is the password that we set when generating your keystore file. 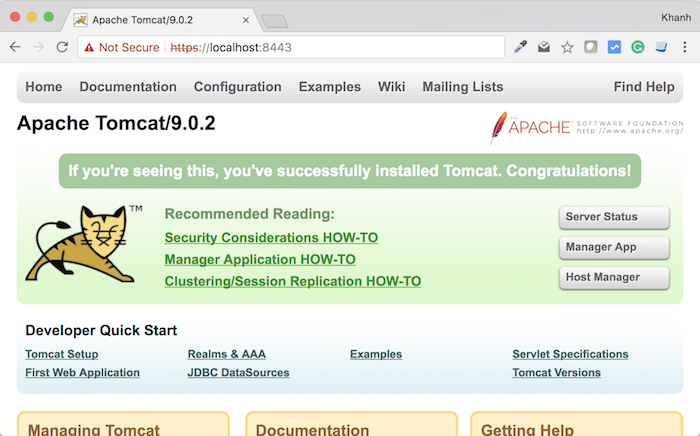 So, we have successfully configured SSL or HTTPS support for Tomcat.